As my mother taught me, and her mother before her and my great-grandmother Monica Tillwack Bura taught her (we called our great-grandmother, Busha), I will host a Wigilia this evening. Traditionally, the meal begins with the sighting of the first star. 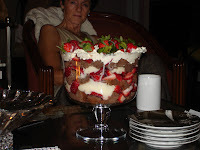 The Trifle dessert was in honor of the Syrian Christian whose Christmas was more English growing up. Besides George, my other guests included Ali, an Iranian whose mother was Christian and father Muslim; Maggie, a former Roman Catholic; and Juliana, a secular Australian, aggressively so. Made for quite a mix. We had a lovely evening. Maggie made the mushroom soup and after some concern, the final mix enjoyed a multitude of flavors. The perogis from Sophie's Place in Baltimore was worth every minute of the hour on line. And my Christmas ham came out great - with pears and cranberries. I was a bit worried about that, as it was a new recipe and I had to make adjustments to the directions to accommodate time away from home to go to church. But my mom taught me her cooking instincts well. I also prepared the traditional cauliflower recipe and the cucumber salad. 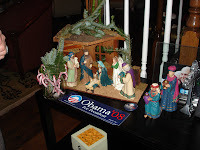 And the evening favor's were in the mode of the city in which I live - a candy cane and an Obama bumper sticker! Here's some more background on the Polish Wigilia that I shared with my guests. 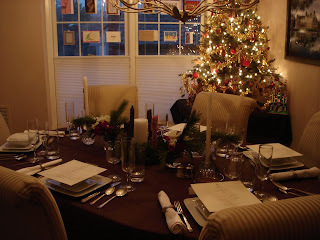 is the Polish meal on Christmas Eve. that it is considered by many to be a greater holiday than Chrismas itself. The meal is traditional and includes from the forest - mushrooms, wild berries and honey. - the breaking and sharing of the Oplatek. Oplatek is taken from the Latin word Oblatum - meaning sacred bread. the traditional wafer and exhange good wishes. Holy Child, the Blessed Mary, the Holy Family or the Angels. The Oplatek is known as the Bread of Love and wafers are sent to absent family members. in the manager & to remind one and all of our humble beginnings. Beside a hay filled manager on her child.